Be the first on your block with fresh, home grown vegetables. Save cold, hard cash vs. supermarket prices. Fewer problems with insects and heat stress. 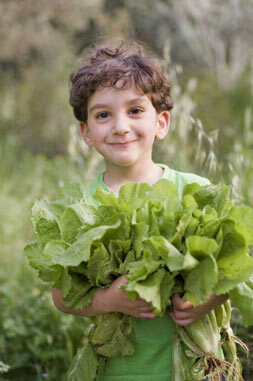 Great way to get kids outside gardening & eating their veggies! Lettuce. Hail Caesar! Nothing like fresh romaine lettuce for your salad. It takes but a little time, space and energy. And lettuce always tastes best when it matures in cool weather. Onions. They can be started 3 ways: sets, seeds, or transplants. Planting sets is easiest. If you can poke a hole in the ground, you can plant an onion set. Carrots. For long, straight carrots, plant them in raised beds or sandy loam soil free of stones. Sweet, tender young carrots make a wonderful snack. Peas. They need an early start to flower and set fruit before temperatures exceed 80 degrees. There is a world of difference in the way fresh peas taste—enough to make you plant them every year. Broccoli. It might not be everyone’s favorite, but it ought to be. It’s really good for you and easy to start with seeds. To get the most vegetables throughout the year, plant cool season veggies now, follow then with warm season veggies in the summer, & then replant more cool season ones in the Fall. Choose a well-drained spot that gets as much sun as possible. This kind of space is likely to provide warmer soil temperatures. If your soil is not frozen, you can start preparing the ground. Use a shovel to turn the soil. Add some organic matter such as compost or Espoma Organic Planting Mix along with some Garden-tone. If your soil is still frozen, containers are a good alternative. Water deeply, but less frequently. Plants in general need less watering in cooler temperatures. Plant seeds or plants according to the directions found on the seed packets or plant tags. If you can’t wait to get your hands dirty in the garden, there’s no reason to get left out in the cold. Give cool season crops a try!